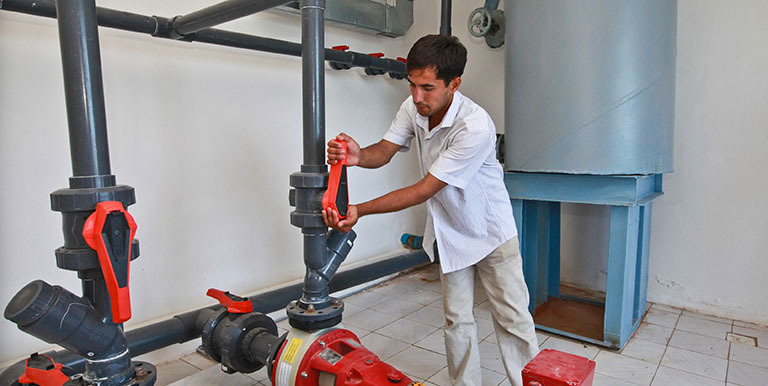 In Uzbekistan, the government is reforming the governance and management of water supply and sanitation to improve supply and delivery of services. Photo: ADB. Attracting private finance to water sector projects is a difficult task—the majority of public-private partnerships (PPPs) in Asia are in the transport and energy sectors—but the benefits go beyond funding. The private sector brings to the project access to modern technologies and knowhow, improved efficiency and service delivery, and turnkey smart solutions. Widespread uptake of PPPs schemes, however, will require significant effort on the part of government; involvement of the private sector does not relinquish government of responsibility. Preparing, negotiating, contracting, monitoring, and managing PPP contracts require a deep understanding of technical and legal issues. To incentivize mobilization of private capital, there is a need to develop a long-term strategy underpinned by a strong legal framework, sound policy, and the political will to bear costs, guarantee risks, and develop trusting partnerships with the private sector. A gradual approach to PPPs, commencing with smaller-scale pilot projects, will help build expertise and confidence in both the legal framework and the abilities of the private sector. This explainer is adapted from proceedings of a workshop conducted by the Asian Development Bank (ADB) in Tashkent, Uzbekistan for the water sector. The term is used to describe a wide range of agreements between public and private sector entities, and different countries have adopted different definitions as their PPP programs evolved. For the purposes of the workshop in Tashkent, a PPP was defined as a contract for providing a public asset or service, in which the private party bears significant risk and management responsibility, and remuneration is linked to performance. The workshop discussed three types of PPP arrangements: management contracts, lease contracts, and concessions. There are many variants within and across these schemes, such as build-operate-transfer, build-transfer-operate, and design-build-operate. In reality, the specifics of a PPP agreement are flexible, and all can be appropriate, provided the responsibilities are clearly defined in a contract governed by a suitable legal framework. Figure 1 illustrates the applicability of these three types of PPP arrangements based on private sector risk appetite, which inherently depends on the potential for tariffs to cover operational and investment costs. For a PPP that seeks to access private finance for specific infrastructure investments, a special purpose company is set up to fulfill the terms of the project (e.g., build-operate-transfer, design-build-operate). PPP law usually specifies that a new company be established for the project to ensure clear accounting and reporting. The typical PPP project structure is illustrated in Figure 2. Capital costs are generally financed by 20% equity investment and 80% debt. BOT=build-operate-transfer; EPC=engineering, procurement, and construction; SPC=special purpose company; SPV=special purpose vehicle. To attract foreign direct investment through PPPs, a sound legal framework is essential. A PPP law is often required to establish a clear institutional framework for developing, procuring, implementing, and regulating these partnerships. PPP laws may also be used to close gaps in existing laws on a specific sector or in procurement or competition laws. prepare and update the project proposal pipeline. investors and lenders must be willing to provide capital for PPP projects. Is there a financial reward? Do the borrowers/project owners have the capacity to implement the contract? Has the borrower invested sufficient equity? Is there a step-in rights provision? Have they successfully worked together before? Are they committed to the long term? Is it a viable project with potential for profit? Is there political and legal stability and political support? Is there a clear legal framework? Are dispute resolution mechanisms in place? Is there clear and well-balanced risk sharing? At the workshop, PPP expert Mats Anderson presented two prerequisites that the Government of Uzbekistan and water utilities should focus on before widespread adoption of PPPs. First, develop accurate baseline data. Know how current systems work and what are the available assets and their condition, and determine water availability and quality. Second, develop a simple, predictable, and reliable arrangement for tariff setting (and transfers/subsidies if relevant). This is important to potential partners to determine the profitability of the project. In the Republic of Korea, the government wanted to promote the PPP market in the wake of the Asian Financial Crisis in 1997–98. It revised the PPP Act in 1999 to incentivize PPPs. It improved risk mitigation, streamlined the procedure for unsolicited proposals, and established a PPP Unit. In addition, the government provides subsidies, if and when these are necessary to keep the tariff at an appropriate, affordable level. The subsidy is determined in the individual concession agreement. On average, under Korean PPPs, 28% of the financing is provided by the subsidy. The chart below illustrates the success of the incentives, with private sector investment in public infrastructure increasing significantly in 2007. After this, PPP investment declined as the infrastructure funding deficit declined; a considerable level of the required infrastructure stock was supplied. At this point, the government took action to rebalance the public/private risk allocation and abolished its minimum revenue guarantee policy that was introduced under the 1999 Act. In the People’s Republic of China (PRC), national demonstration projects serve as models of PPP implementation. The government promotes PPPs through an annual Public-Private Partnerships Financing Forum, which brings together government officials, investors, financial Institutions, and the private sector. The Ministry of Finance has created a National Public-Private Partnership Integrated Information Platform, a project database accessible to policy makers, potential investors, and the public. As of end-September 2017, there were 14,220 projects in the PPP pipeline with a total investment of $2.69 trillion. In Armenia, the government outsourced water utility management to the private sector in 2004 to improve confidence in the utilities and stimulate investment, said PPP expert Eduard Chil-Akopyan at the workshop. The country’s water infrastructure was aging and in need of replacement. There was a centralized water planning system, no tariffs, and water supply was scheduled for a few hours each day. Some investment was made in partnership with international financial institutions but they had little confidence in the management capabilities of the utilities to generate suitable revenues and deliver sustainability. Improvements in the water supply were made through PPPs under a 2-year pilot project, which resulted in concrete successes, as outlined in Table 1 below. After some teething problems, utility management improved, mobilizing further financial resources from donors. Even though management contracts improved utility performance, rural utilities still operated at a loss relying on fund transfers to maintain operations. To reduce these subsidies the government decided to lump all utilities together under a single nationwide lease agreement for 15 years in 2017. This made it possible for profits from urban areas to cross-subsidize losses in rural areas. provide training and capacity development. Asian Development Bank. 2018. Public-Private Partnerships and Smart Technologies for Water Sector Development. Manila. Jung Ho Kim is primarily responsible for developing and managing municipal infrastructure development projects to deliver the best possible public utility services in Georgia and Uzbekistan. He has about 20 years of professional experience in private and public-sector urban infrastructure project development and implementation, including around 10 years working in ADB. He has an investment banking background and holds a post-graduate law degree from Northwestern University School of Law.